Exclusive new Designer Desktops set for Design Milk: “Light As A Bird” released! 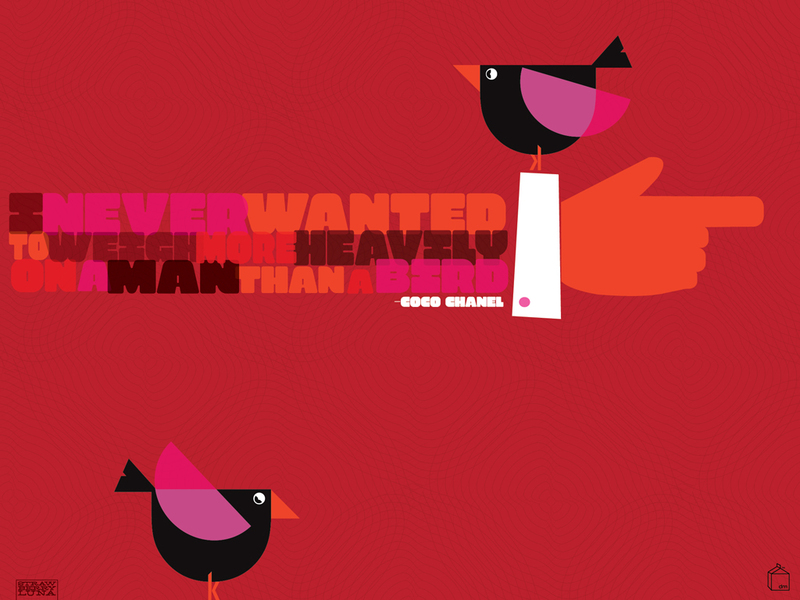 Click to download a free, full-sized version of our Designer Desktop for July from Design Milk! Formatted for your computer, iPad and iPhone. 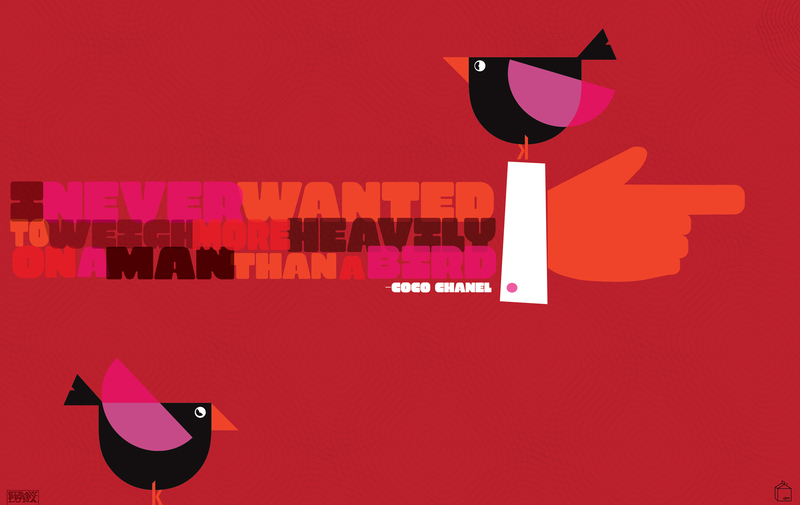 (huge shout out thanks to lovely Kelly at Design Crush for the recommendation) in May to be a part of their ongoing curated Designer Desktops series. 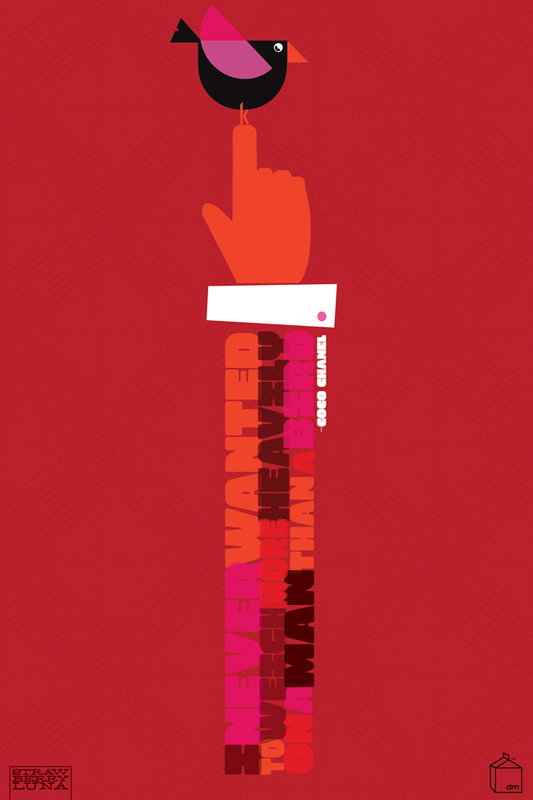 Of course, being a fan of Design Milk for quite sometime I said yes right away. 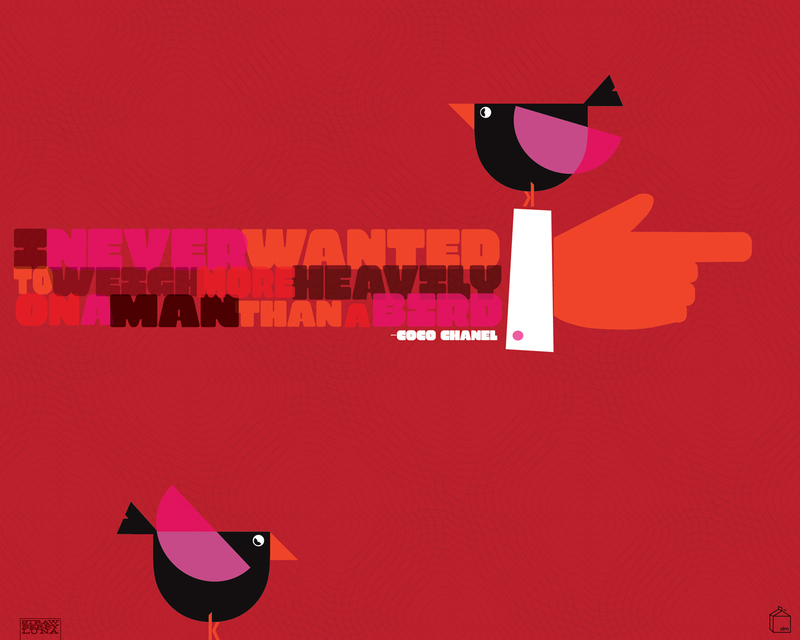 So drop on by Design Milk and get your free, light as a bird new desktops and wallpapers and spiff up! Lately, I’ve been really obsessed with 60’s design, but not the psychedelic and (to me) overly wrought side, but more of the very clean and simplistic designs that came out of Madison Avenue in the forms of advertising and brand / logo design and cohesion. There is something so appealing about those directions to me, very pure. This print and design is a part of that interest, as well as a statement on everyday negativity & violence, be they figurative or actual. Hey negativity! Scram! Just feed, water, and nourish love and it will grow like a flower forever. 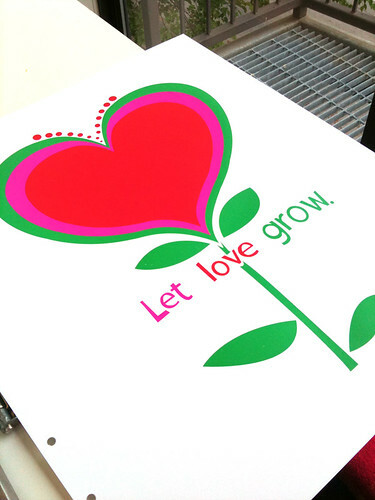 This simple scene is my newest art print “Let Love Grow”, bright & ready to help you plant seeds happiness and love all around you. Featuring hand lettered text, it’s a perfect gift of hope and love for your sweetie pie, as a wedding gift, for a young person in your life, or to brighten up your own home. 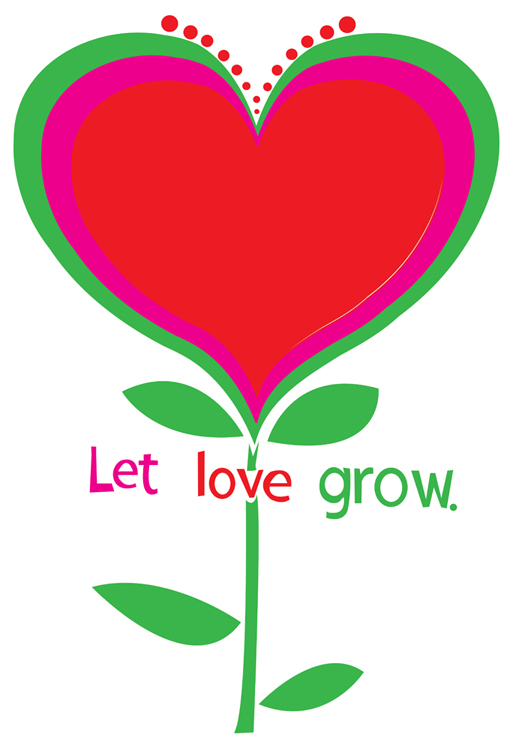 Love: Let it grow bright and strong. 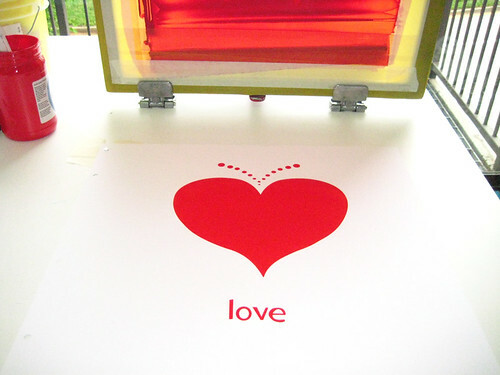 You, my friend, are looking at my 3-color, all hand screen printed, limited edition art print with fresh spring green, vibrant magenta, and heartbeat red hand mixed and non-toxic water based inks. Edition of 190. Size: 18 x 22 inches (45.7 cm x 55.9 cm.) Paper: acid free & archival Cougar, White 100lb cover weight. 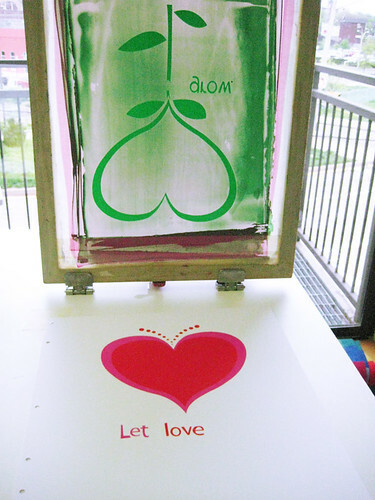 Below are some process photos, now also up on my Flickr account, of this art print, “Let Love Grow” being printed. Got questions? Shoot me an email! 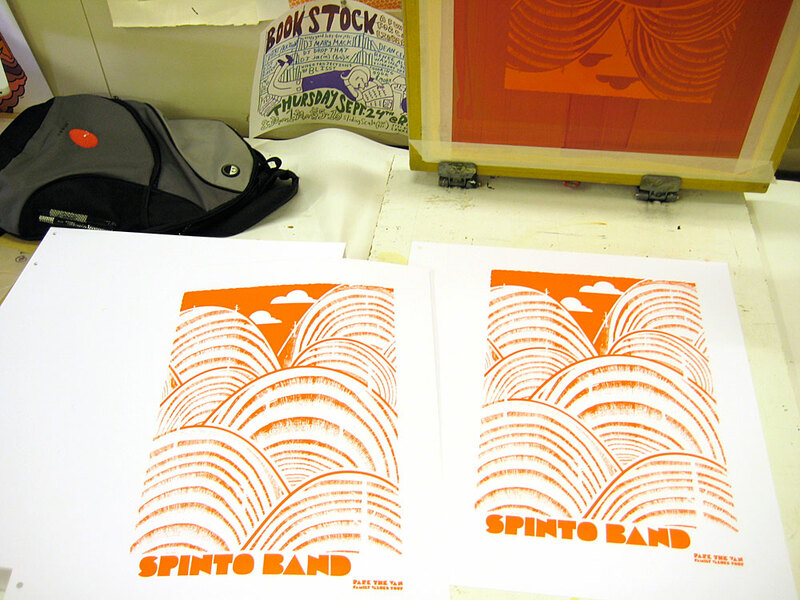 New poster released: The Spinto Band tour poster! 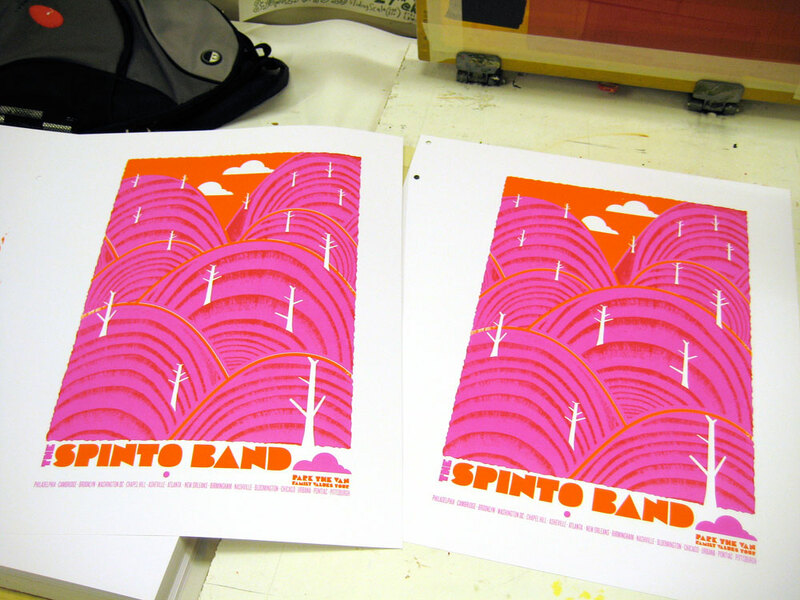 Hand screenprinted, 4-color tour poster for The Spinto Band,. Click here for more information! Hey hey! Brand new poster finally released and out there for you! It’s my fall 2009 tour poster for The Spinto Band, with Generationals & Pepi Ginsberg‘s Park The Van “Family Values” fall super tour. Hooooraay! I love ’em. Bright, fun, hard workin’ and rad. 3 super sounds in one show poster. 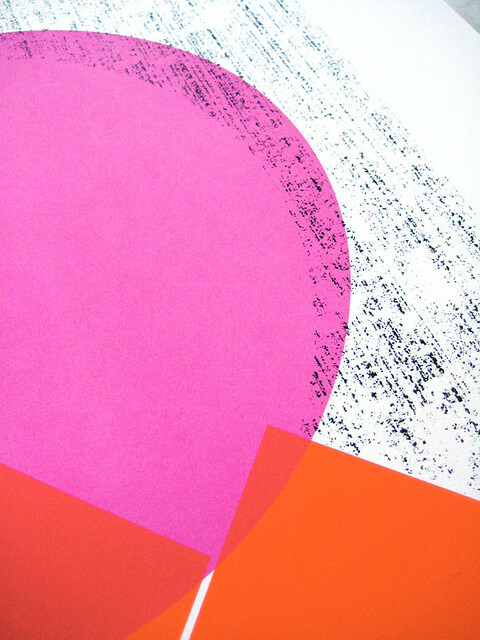 What you see here is a 4-color poster with magenta, sunny orange and black inks. Size: 16w x 22h inches. 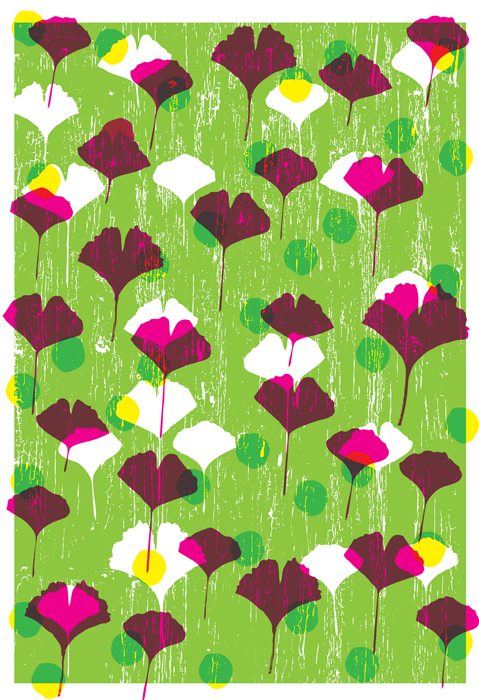 Edition of 145, though I have only 30 for sale and the rest were sold on tour with the band. Paper: acid-free & archival Cougar 100 lb White, cover weight. Now available for purchase at my website HERE! 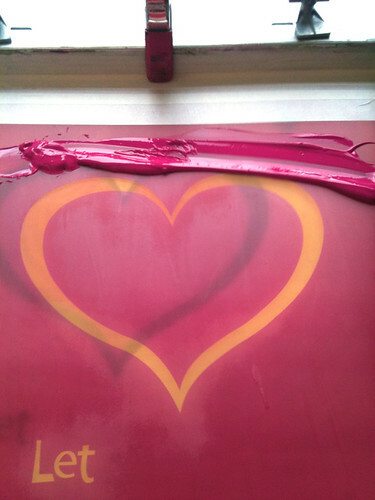 2nd color, transparent magenta, lets the orange under layer show through and it makes a nice ruby red where they overlap. 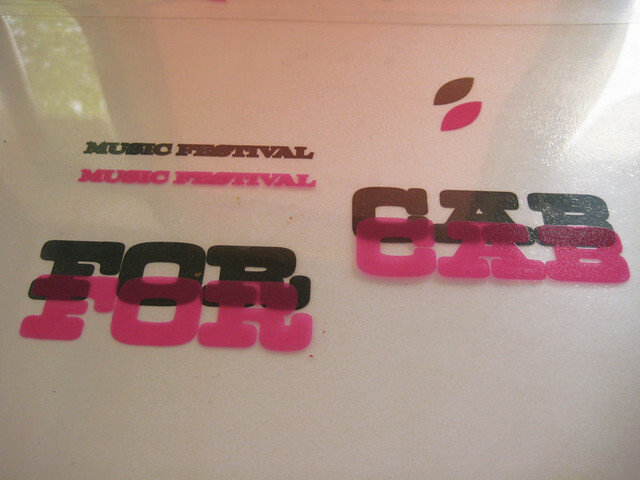 And, some more good old fashioned hand printing process photos are here on my Flickr page too. Ok, I won’t lie. This summer and well, now early fall have been breakneck speed work, travel to several shows all over the country (Chicago Flatstock, Seattle Flatstock & Chicago Renegade, to name a few), packing orders (with many prints and posters now sold out) and more work for me here at strawberryluna World Wide HQ. So much so that I seem to have forgotten to update my ol’ bloggery here with a few “new” prints and posters. Whoopsie daisy Maisy! Hey, remember Joe Cocker? The man was and IS a rock’n’roll animal to the core. And, he’s been touring pretty much non-stop since the John Belushi SNL skit days, (too young to know what I’m talking about? Weren’t watching SNL as a little kid like I was? Learn here whippersnapper.) Anyway, I had the supreme honor of doing a poster for his show at the Delta Classic Chastain Park Ampitheater in Atlanta, GA. 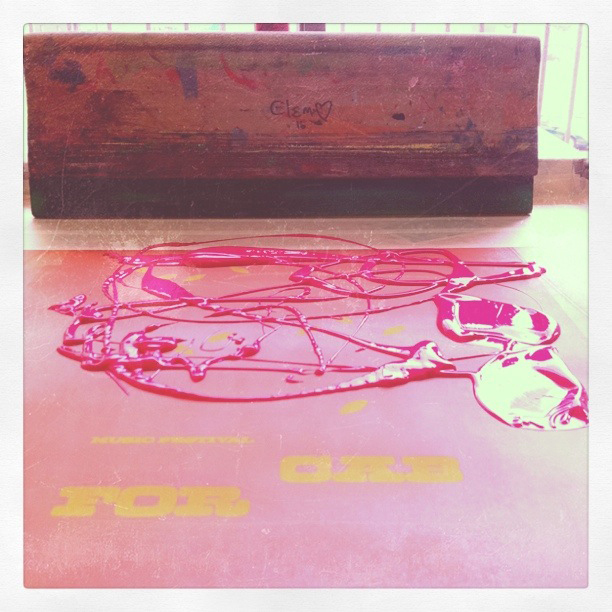 Offset printed, 4-color, CMYK poster for the incomparable Joe Cocker. Click to purchase or for more info! Next up, is my rainy day homage to one of my favorite US cities: Seattle! For one of the premier rock poster shows, Flatstock, designers & poster artists have free range to produce a poster for each Flatstock and it’s super fun to do. This year for Seattle’s Flatstock, which happens during the Bumbershoot Music Festival, I made a little play on Seattle & Pittsburgh’s similarity – rain. This poster is based on an illustration that I’ve had floating around for about a year and that I really wanted to use, so I added some musical notes and textures and a lil mod-city in the background to finish the layout. Hope that you dig. 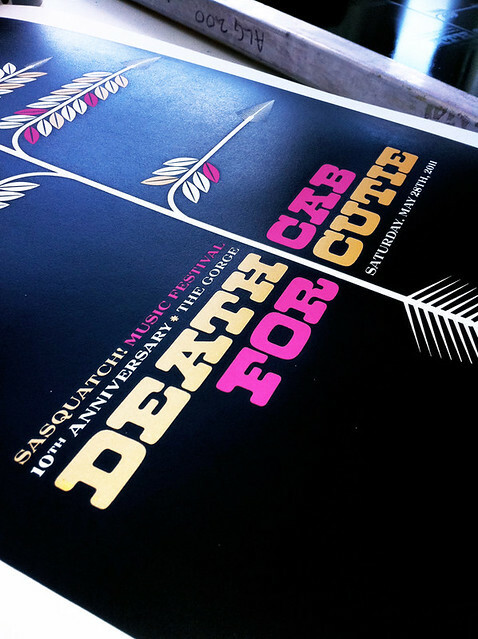 Hand screenprinted, 3-color poster for Flatstock Seattle, 2009 & Bumbershoot Music Festival. Click to purchase or for more information! 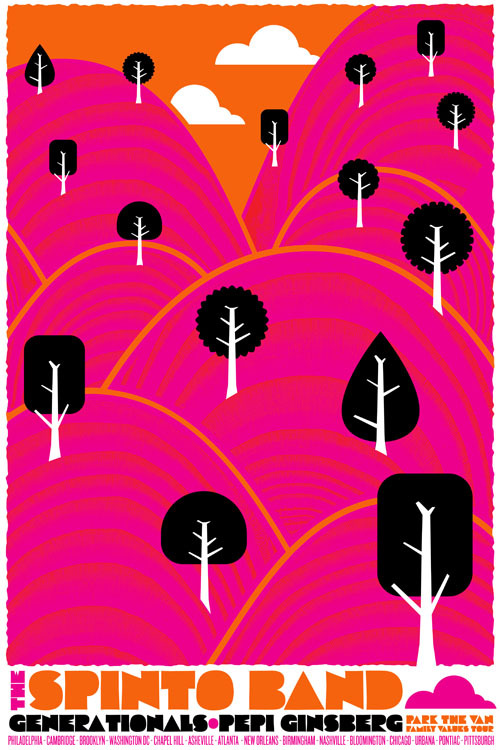 And, just in time for autumn, I’d like to premier my Summer 2009 art print, the next new print in my Seasons series. Oh yeah! On time like a bus on a sleeting Christmas Sunday. And not a hair too soon before my Fall 2009 print is done and ready. Ho, ho ho. 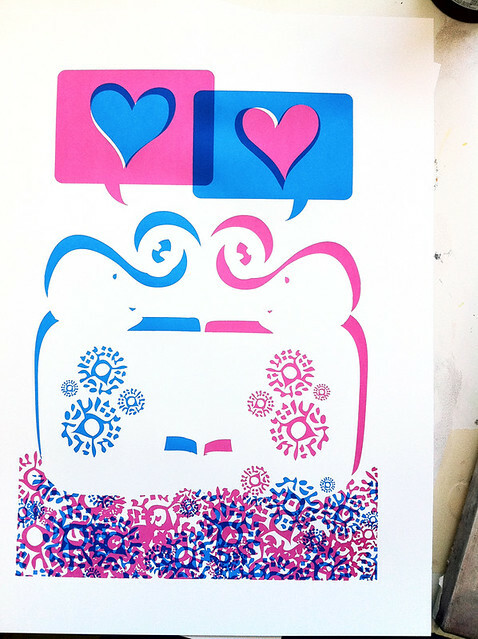 Loads of overprints dominate this hand screenprinted breezy summer lovin’ expression. 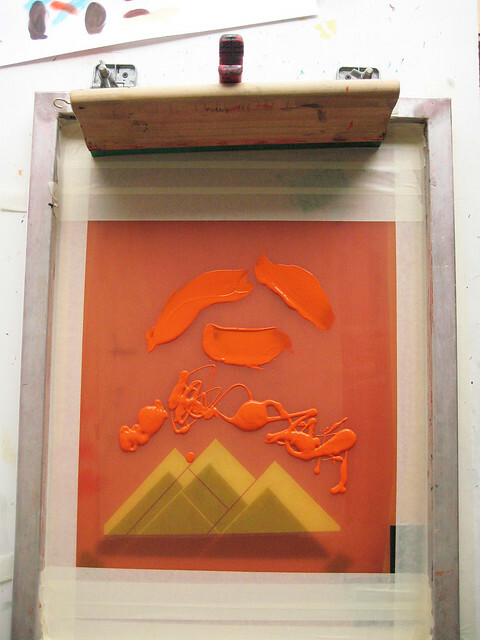 Hand screenprinted, 7-color art print, Summer 2009. Available at my website now. Click to purchase or for more information. And lo & behold, last but not least, my most recent art print, the newest colorway of my super popular Going To See My Baby print, this time is fall-ready orange. Hence the name, Going To See My Baby Orange. Tricky! I know. Who doesn’t love love? 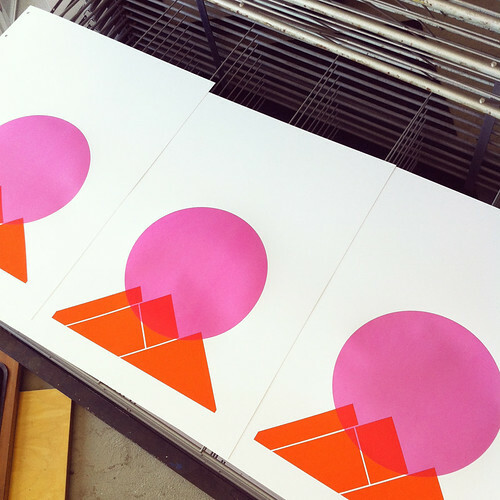 New colorway of my 5-color, hand screenprinted art print, Going To See My Baby Orange. Available on my website now. Click to purchase or for more information! Ok then, I think that we’re all caught up. Bye summer! 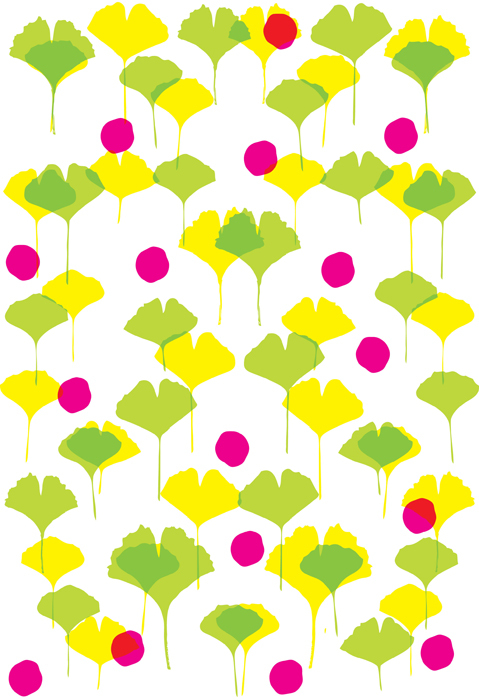 Sketch of upright green & yellow Ginko leaves and some unnaturally colored berries. I’ve been obsessed with the shapes of Ginko leaves for about as long as I can remember, having grown up around them. The tree species was one of a great handful introduced to the United States via my hometown of Philadelphia by avid botanist and horticulturist named William Hamilton in 1784. Other than the admittedly terrible smell of the berries dropped by the female trees, they are simply incredible and beautiful. Falling Ginko leaves and berries gathering on the ground. 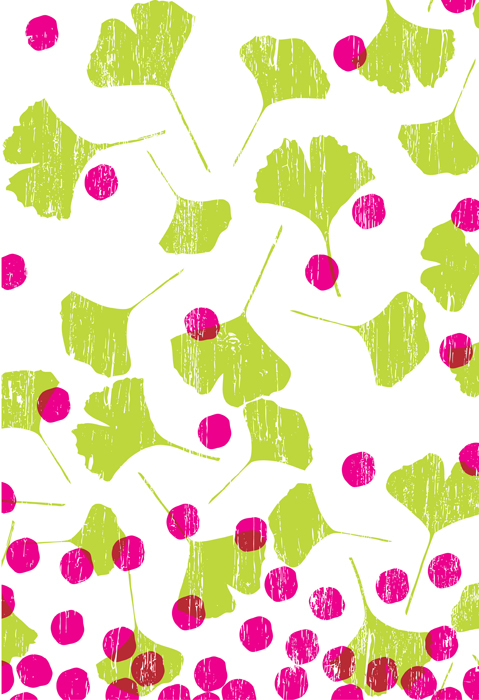 Last week I started sketching and doodling with some variations on Ginko leaves, berries and textures. 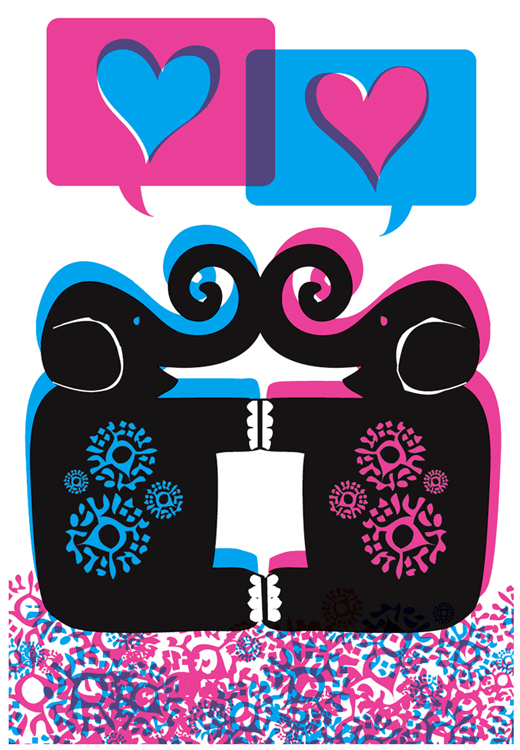 Here are a few of those doodles, designs, sketches, what have you, and I also put them all up on both my Flickr account and over in my Spoonflower portfolio as well. Feel free to comment and let me know which you like best, or, conversely, if you think they stink like a Ginko berry. The further I went, the more it not only felt nice to be sketching, but it felt as though I was working on a textile pattern, perhaps bedding. Which, is extra nice. Sleeping is nice, and I’ve always been very interested in textiles, fabric, bed inens and their design. Odd, maybe. But true nonetheless. 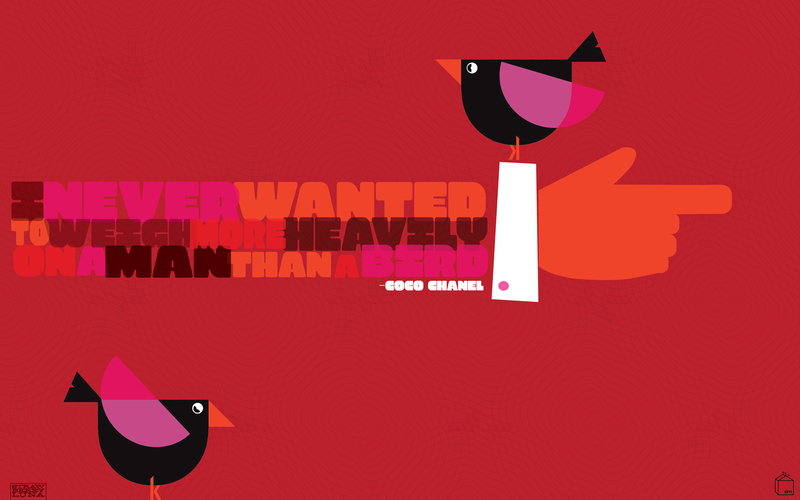 Still, it’s clear that I need to learn a good deal more about how to make repeating patterns. Even so, I figured sharing the designs might be fun. Sort of a free-for-all in color, texture, and overprinty-ness. The Ginko is an incredibily ancient species, with fossils dating back to the Permian period, some 270 million years ago. Amazingly, the Ginko’s loveliness almost died out, only to persist in such small numbers that the species is listed as a living fossil. There is something very comforting and assuring to me about the lovely fact that something so beautiful could last for so long and throughout so many massive changes. Yes, I am corny like that. New poster released: A.C. Newman & The Broken West! 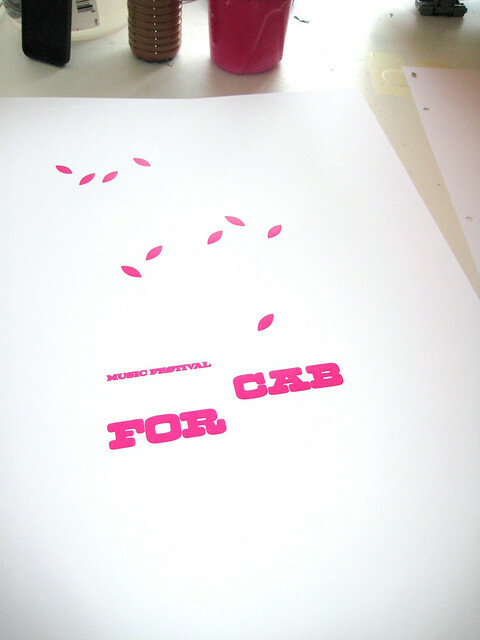 Hand screenprinted 4-color poster for A.C. Newman & The Broken West's show in Pittsburgh. PA.
Yeps! 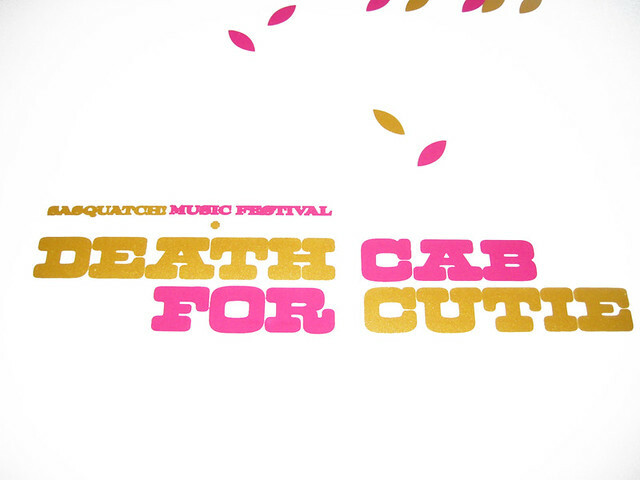 It was a great show, and sold out, did you go? The show was in the film theater of the Andy Warhol Museum, there was room for maybe about 150 people, so maybe you did and maybe you didn’t. If you’re the latter, too bad. it was an awesome show, replete with jokes about dickery and private dressing rooms in one’s mind. 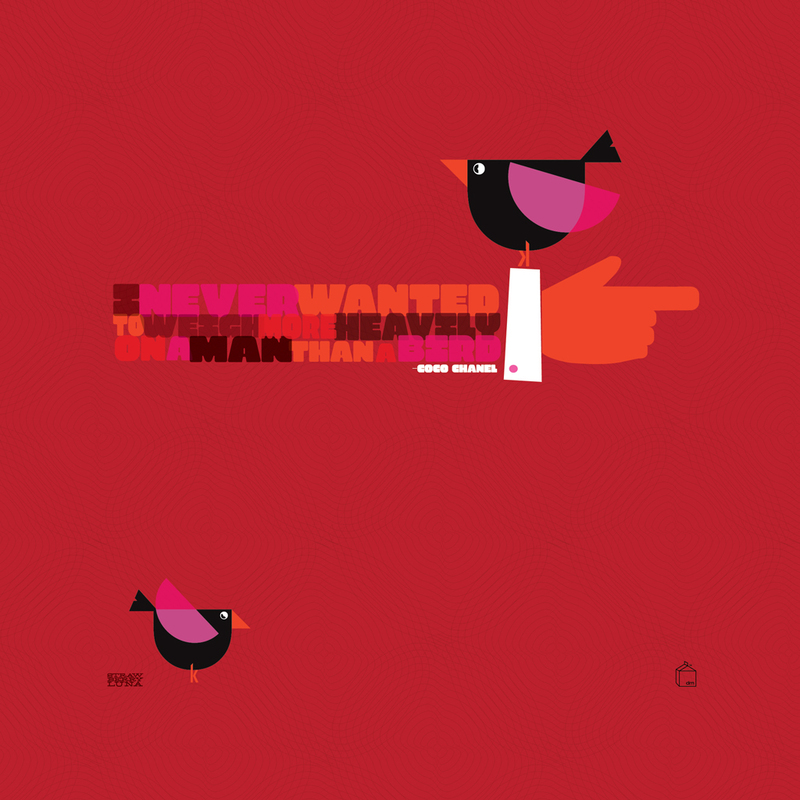 The above is my poster for the show, proudly a part of the A.C. Newman spring tour 2009 poster series for their show with The Broken West (they were lovely) on Saturday March 28th 2009 at The Andy Warhol Museum in Pittsburgh, PA. Getting to do a hand screenprinted poster for any show at the Warhol Museum is a thrill in an “extension of a legacy” sort of way. If you feel me. 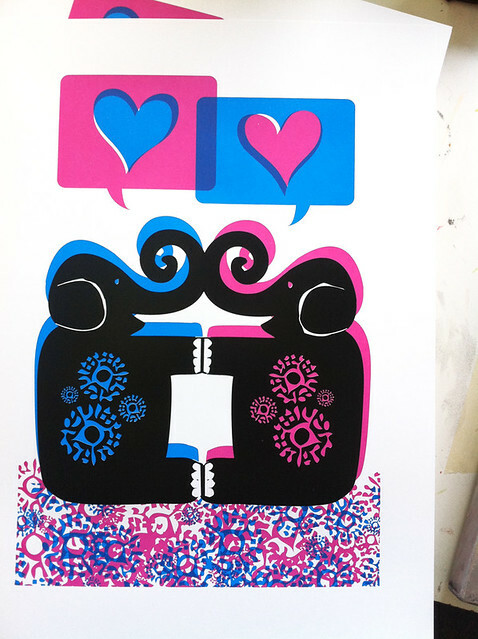 This swirling hypnotic psychedelia is my 4-color, all hand screenprinted poster with black, magenta & cyan inks. 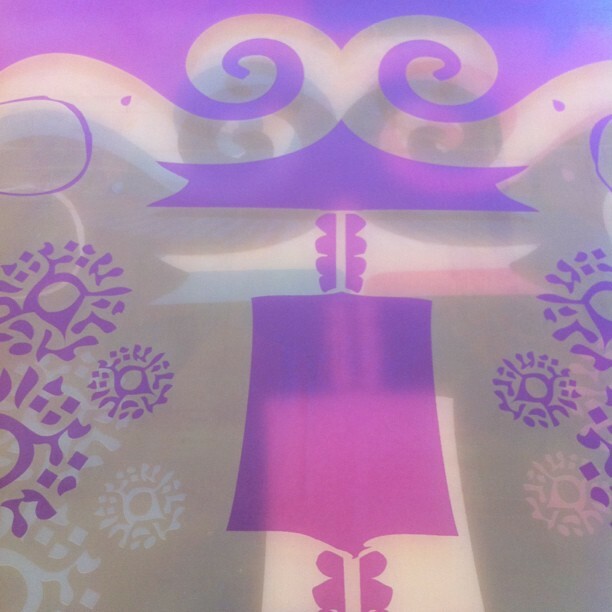 Overprint magic makes a pretty luscious violet. 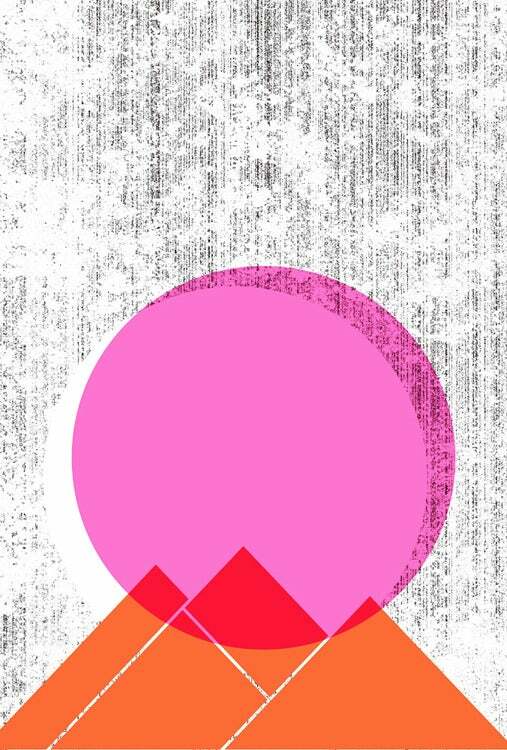 Edition of 150 Size: 16w x 22h inches. Paper: acid-free & archival Cougar 100 lb White, cover weight. 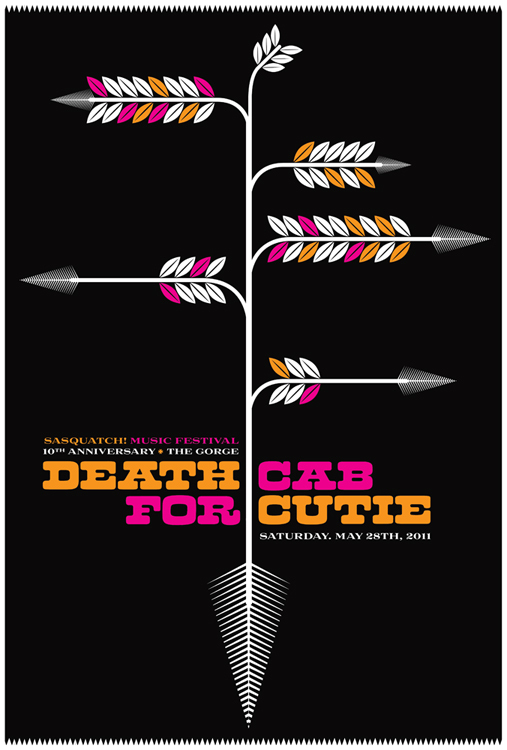 This poster was available on tour with the bands at the show and is now also available from my website here. And, if you enjoy geeking out as I do, there are some process photos of this poster on my Flickr page of this poster being printed. Screens'n'Spokes benefit art print, 2-color screenprint available exclusively at the Screens'n'Spokes Etsy store. Multiple Sclerosis is an often debilitating disease that strikes millions around the world. It is estimated that over 400,000 Americans are currently living with the autoimmune disease. 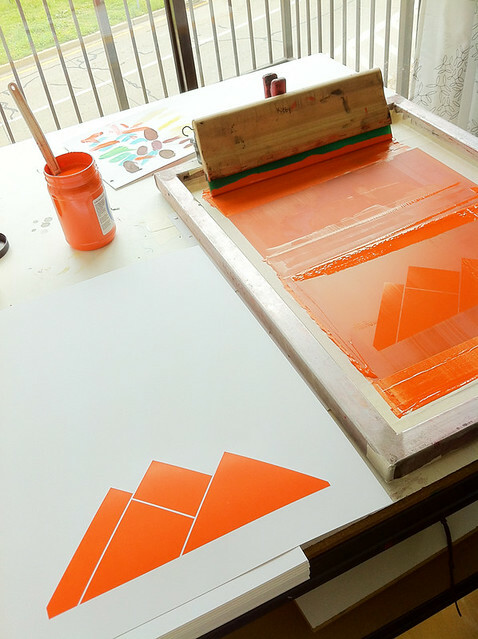 Some of our great friends at Team Screens’n’Spokes came up with a fantastic way to help raise money for the National MS Society by combining screenprinted art and the annual MS Bike Ride. 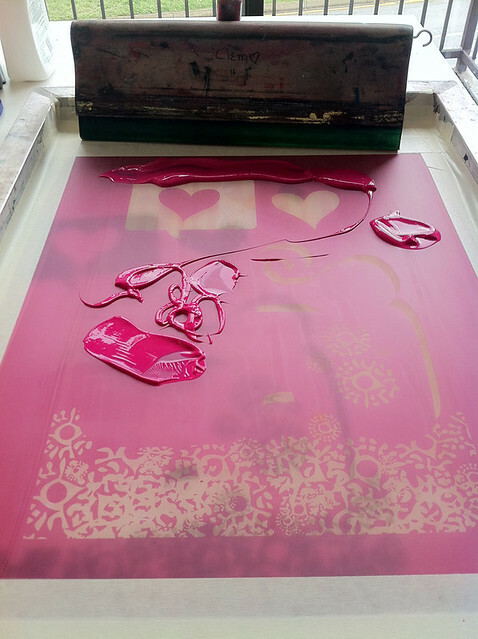 Screens’n’Spokes combined the love of bicycles, the MS Ride and their affection for all things screenprinted. They tapped their connections and friends in the scene and BOOM! Magic happened. For the second year in a row, I was pleased to pitch in and help Screens’n’Spokes who this year were able to raise an amazing $50,000+ for the National MS Society by designing and printing this print for them. Screens’n’Spokes has an Etsy store, and that’s where my print is available exclusively for sale online. 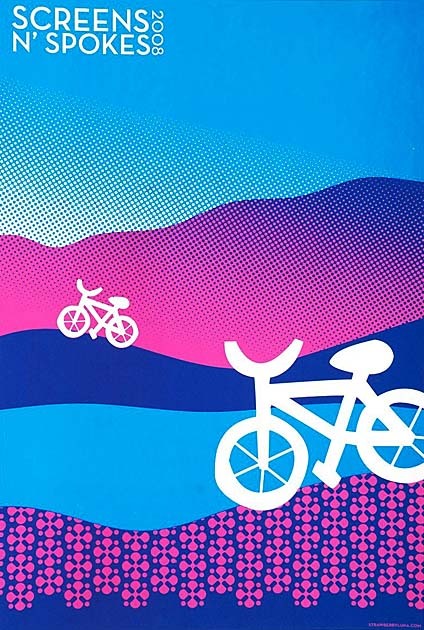 With 2 art simultaneous shows in September – November, lots of folks got to see the hand screenprinted bicycle themed art from over 25 artists. Missed the shows? 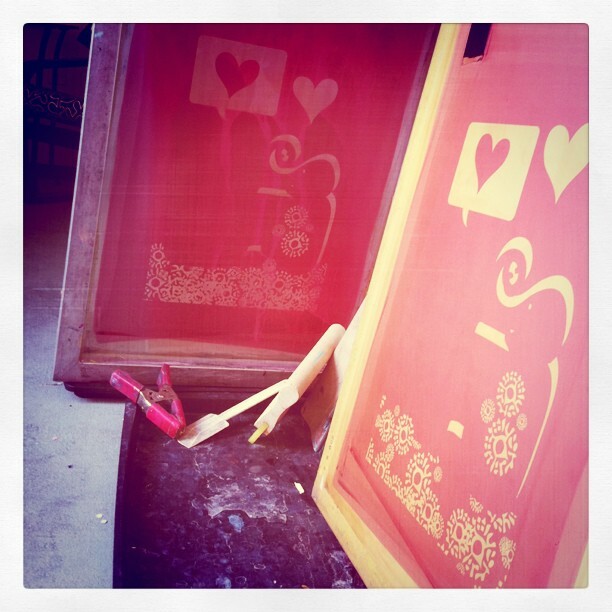 Check out Screens’n’Spokes Etsy shop take a gander. Proceeds benefit the NMSS.